A deliciously healthy Thermomix Chocolate Peanut Butter! You guys know how much I love making my own peanut butter in the Thermomix right" Well this healthy Thermomix Chocolate Peanut Butter takes it to a whole new level. And yep, it’s HEALTHY!! To make this choc-peanut butter, all you’ll need is some roasted peanuts (you can use either salted or unsalted) and some cocoa (or cacao powder). That. Is. It!! 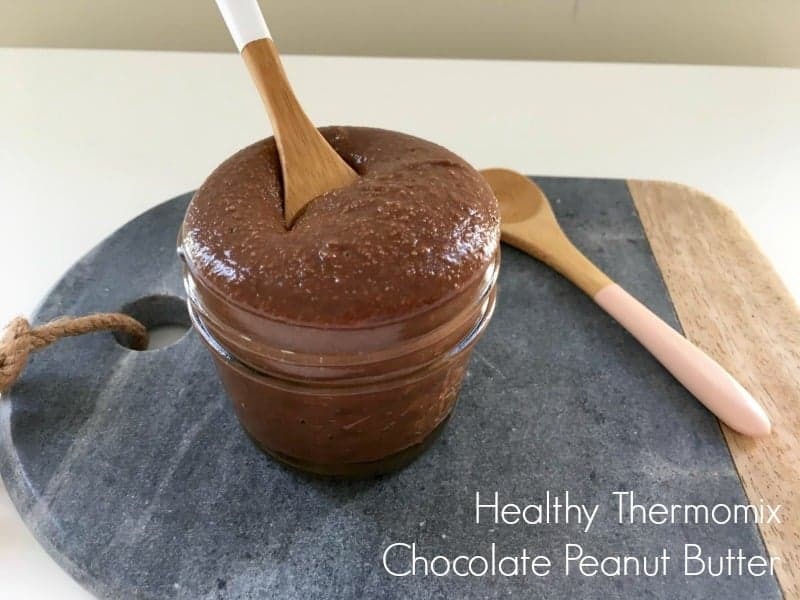 So simple, right"
Once you taste this healthy Thermomix Chocolate Peanut Butter, it’s going to be very, very hard to stop! And yep, there’s a fair chance you’ll find yourself eating it straight from the container (or is that just me!!""). Store at room temperature in an airtight container for up to 3 weeks. Feel like some more healthy treats" Click here to check out some of our other fave healthy recipes! A deliciously healthy Thermomix Chocolate Peanut Butter made with just 2 ingredients (roasted peanuts and cocoa powder!). Place the peanuts into the Thermomix bowl and increase to Speed 10 for 20-30 seconds. Scrape down the sides of the bowl and repeat on Speed 6 until smooth. Add the cocoa powder and continue to mix on Speed 6 (while occasionally scraping the sides of the bowl).